Any time I’m making something, it needs to be quick and easy with minimal ingredients. Guacamole fits that criteria perfectly. Mix avocados with a little red onion, cilantro and some lime juice. Done. The nice thing about guacamole is that there is room to play with the ingredients to make it your own. If you want to spice it up, just add some diced jalapenos. Do you like things a little sweeter? Just add some chunks pineapple or mango to it. Personally, I like it sweet AND spicy! 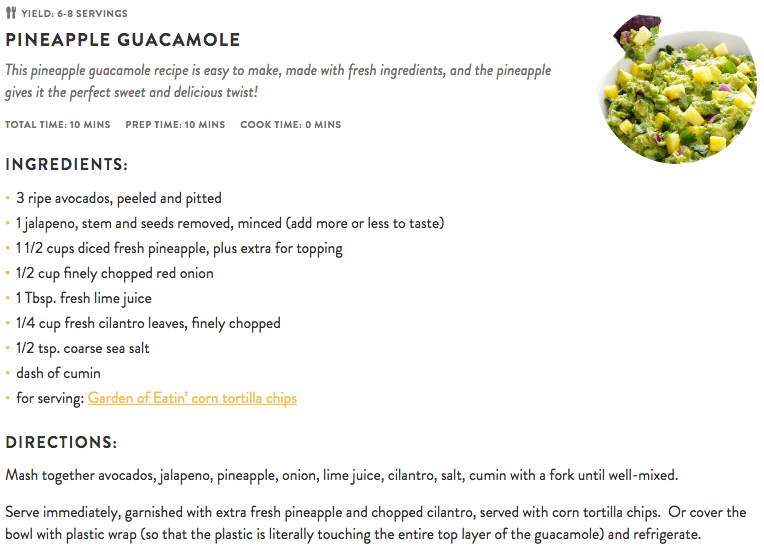 I searched for a guacamole recipe that included both sweet and spicy elements and came across this pineapple guacamole on gimmesomeoven.com. It adds diced pineapple and jalapeño to traditional guacamole. I tried the recipe at home and couldn’t stop eating it! It was so good! The creaminess of the avocado, with the crunch of the red onion, the sweetness of the pineapple and the spiciness from the jalapeño all scooped onto a salty, crunchy tortilla chip!!! Gimme some of that! The recipe takes only 10 minutes to make! First, you'll want to prep all of you ingredients. Next, you'll want to add all of the ingredients to the mashed avocado. That's it! Simple, easy and fresh. Serve with your favorite tortilla chips and enjoy!